If you are looking to plan a relaxing day in the Napa Valley, Provenance Vineyards is a must stop. 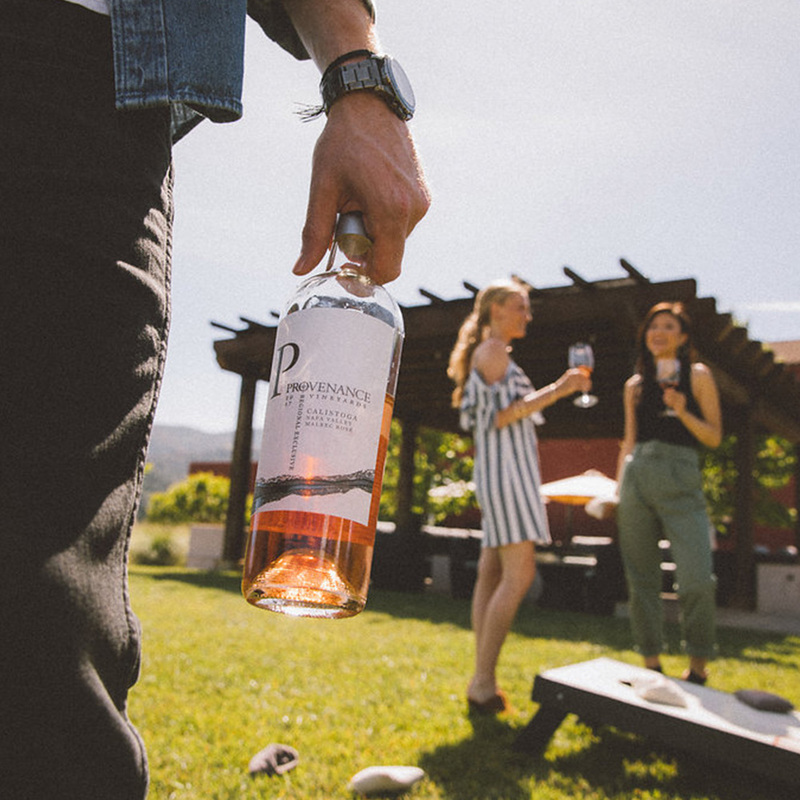 Provenance Vineyards is one of the few wineries in Napa Valley where you can bring your own food and picnic. This centrally located winery is the perfect place to enjoy a full glass of wine, play lawn games, and take in their one of a kind art. Provenance Vineyards has always been known for its big red barn and now there is something new to catch your eye. A one-of-a-kind mural now graces the side of the tasting room. Created in partnership with San Francisco based artist Heather Day the new mural is meant to capture the beauty of the Napa Valley landscape. The design blends the natural elements of earth, sky, water, and flora which creates a unique setting to enjoy your afternoon at Provenance Vineyards. With Provenance Vineyards new Rent-A-Picnic program you can enjoy lunch at the winery, a truly unique experience. Each picnic “pack” includes everything you need for the perfect picnic experience. Packs include a picnic tote, cheese board & knife, wine opener and Govino glasses to take home as well as a rental winery picnic blanket, umbrella and wine chiller. The best part is that 25% of each rental will be donated back to Creativity Explored, a non-profit supporting those with developmental disabilities in their quest to become working artists. Make sure to make a reservation for your Rent-A-Picnic as they can sell out, especially on the weekends. Once you pick up your Rent-A-Picnic, spread out on the lawn and settle in for a fun filled afternoon. Challenge your friends to a fun (or competitive) game of corn hole, connect four or giant jenga. All that is missing is the wine! While you lounge on the lawn and enjoy the warm California sun take the time to explore the full portfolio of Provenance Vineyards. Focusing on small lot Bordeaux Varietals, Provenance are approachable and pair perfectly with picnic food. If you prefer a light and crisp wine to go with your deli sandwich choose from one Provenance Vineyards three Sauvignon Blancs. Hewitt Vineyard Cabernet Sauvignons or one of my personal favorites their Malbec pair perfectly with stinky cheese or creamy brie. No matter if this is your first time to the Napa Valley or if you have visited a dozen times an afternoon at Provenance Vineyards is sure to be an afternoon you won’t soon forget. There are lots of great places to pick up food for your picnic on your way to Provenance Vineyards. Yountville Deli, Atelier Fine Foods, and Oakville Grocery all specialize in traditional picnic foods. Still want some help deciding what to pack? Check out the following tips in my blog The Perfect Picnic.